Is your inbox bombarded with marketing emails? Yes, email marketing is an extremely powerful channel of communication for both B2B and B2C businesses, but with increased competition for attention in your prospect’s inbox, it’s harder than ever to get noticed. A lot of work goes into crafting an email campaign, but even if your messaging and offer is spot on, the fate of your campaign rests on one thing and one thing only: the email subject line. If your email subject line doesn’t attract interest then the recipient simply won’t click to open the email. Even worse, if you don’t follow best practices, you could end up being redirected by spam filters and never seen. So, if you want to get results from email marketing, you need to become an expert subject line creator. Luckily, given the maturity of this space, there’s been a lot of research and testing done to determine what works and what doesn’t. Becoming an expert at writing subject lines isn’t as hard as it sounds – you just need to know which formula to follow. To help you out, I’ve refined the best email subject lines into 13 ingredients. Use and test a combination of these ingredients in your email campaigns to skyrocket your open rates. Benefit-driven email subject lines are very common and should make up the bulk of your email communication to your list. It’s that old marketing adage that copy should talk to the benefits rather than the features. By articulating that your subscriber could overcome a pain point or achieve an objective by opening your email, they are driven by self-interest to open it. Personal Benefit email subject line example. When running an email campaign, you likely have an offer of value to entice your subscribers to take action. This may be a free resource, an exclusive discount, or something else you’ve come up with to generate interest. If you mention this offer in the email subject line, you increase the chance of someone opening it. The reason why is fairly simple: Basically, we all love free stuff or that feeling of getting a deal. 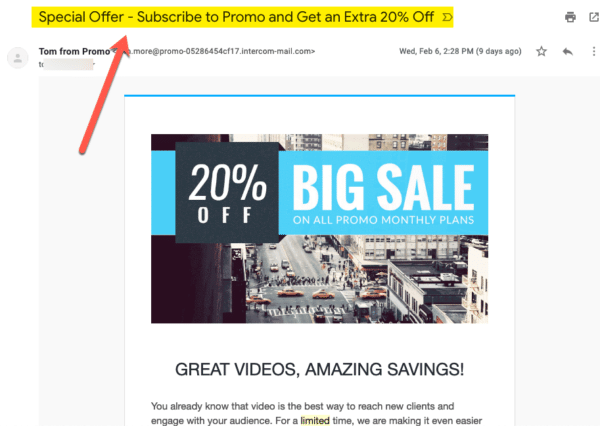 Offer email subject line example. If you have an engaged audience, they will likely be interested when you have an announcement to make. That announcement may be about a new product line, something valuable you are doing in the community, or a strategic partnership you have established. 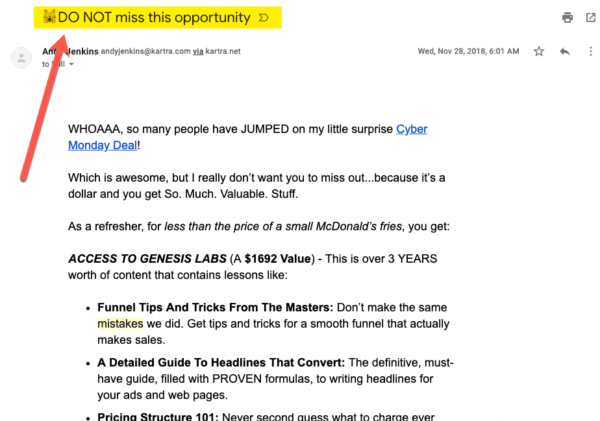 Don’t “hide” the announcement behind a clickbait email subject line. Spell it out for everyone to see. 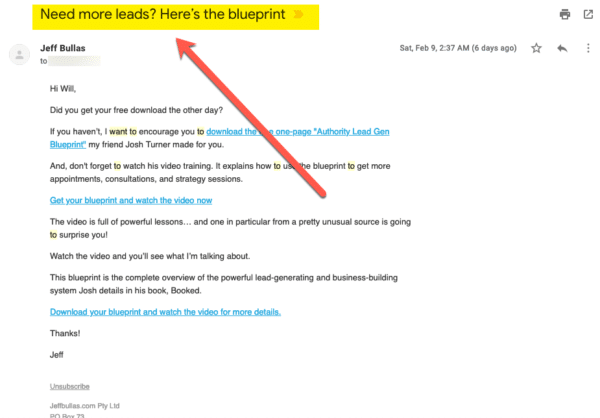 You’d be surprised at how effective this straightforward approach can be at enticing email opens. Announcement email subject line example. This email subject line tactic leads on from the “Personal Benefit” example in section one. As well as articulating a benefit to your subscribers, you may choose to flip this equation on its head and instead focus on negative outcomes as they relate to your prospect’s challenges and desires. The general idea is that you persuade someone to open your email by instilling a small amount of fear on the contrary. For example, phrases such as “Avoid these mistakes if you want to X” or “Discover the one reason why X failed” are hard not to click! 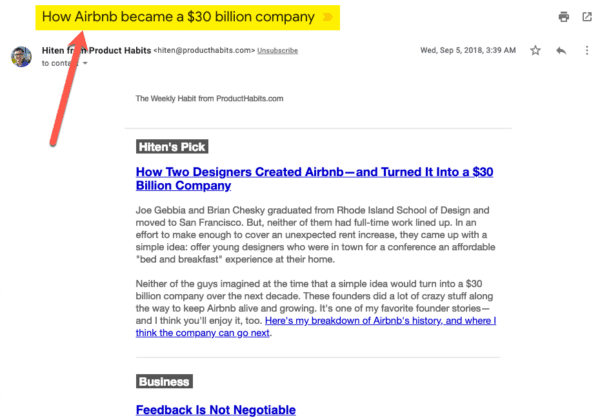 Reverse Psychology email subject line example. 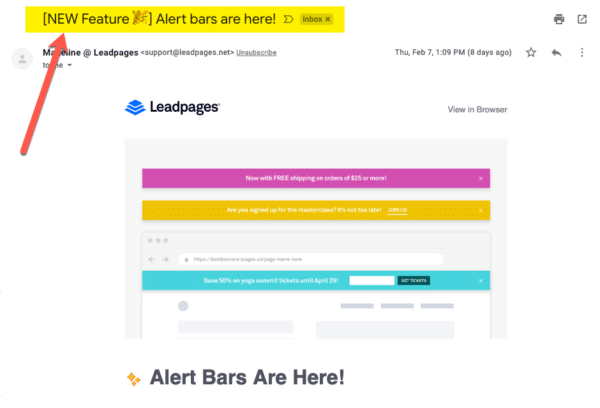 Urgency (your time is running out) and scarcity (the stock is selling out) are the two most powerful psychological triggers for initiating action from your leads. They tap into our innate fear of missing out on something (FOMO). By leveraging these two components – one at a time – in your email subject lines, you will inevitably increase your open rates. Typical examples of this tactic include a limited time offer or an exclusive product with only a few availabilities. Just be careful that you don’t over-use these tactics as your list will become fatigued and less interested. Urgency email subject line example. Including the latest news and trends from your industry in an email subject line shows your prospects that you are active and relevant in the space. It also triggers curiosity and a human desire to “know what is going on”, so they have something to talk about next time they are standing around the water cooler. News email subject line example. The psychology of social proof is why trends such as influencer marketing and user-generated content are so effective – we make decisions based on the behavior and recommendations of those we like and trust. 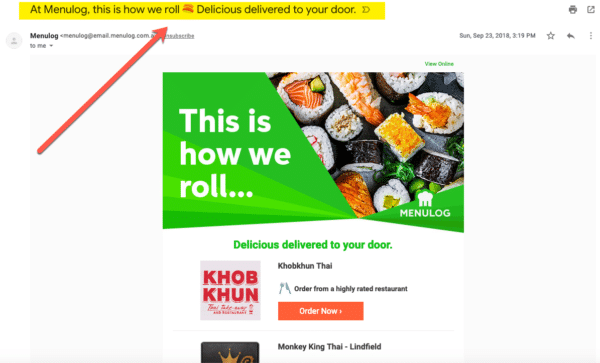 If you can sprinkle an ounce of social proof into your email subject line it increases the chance that someone will open it. 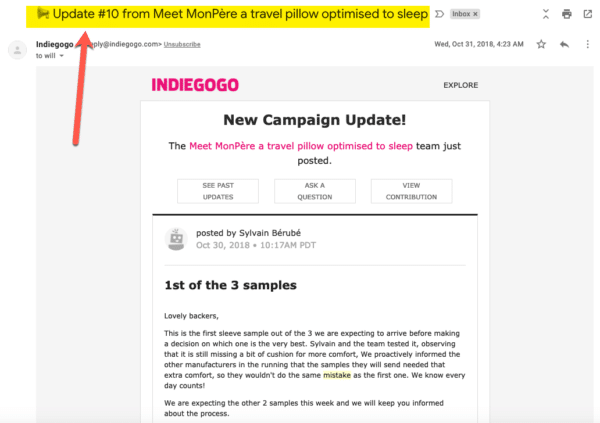 Social Proof email subject line example. As consumers, we like to think that we are rational in our decision making. But in reality, we make decisions based on emotion and rationalize those decisions with a story that we tell ourselves. If you can tap into someone’s emotion with your subject line it is going to trigger a feeling deep inside them that will encourage a click. Emotions can range from love to hate and everything in between. Emotional email subject line example. Humans don’t like being left in the lurch. We crave closure and understanding. This is why subject lines that spark curiosity are great at enticing an open. Curious headlines include open-ended questions, promises, strange facts, and anything that leaves part of the thinking to the imagination. Curiosity email subject line example. Well-positioned humor is one of the most memorable forms of marketing you have at your disposal. If you make someone laugh, they’re more likely to create an emotional connection with your brand. The tricky thing about humor is that it’s hard to achieve in the restrictions of an email subject line. But it can be done! Humorous email subject line example. Research by MailChimp found that recipients are 75% more likely to click on segmented campaigns than non-segmented campaigns. You can spice this engagement rate up a notch higher if you also include personalization in the subject line. 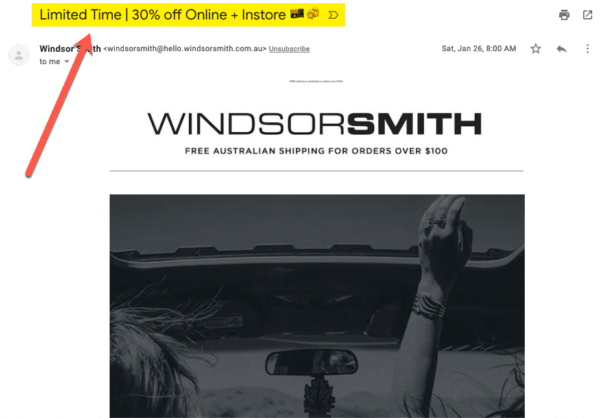 This tactic is great for abandoned cart email campaigns where you can tag and itemize specific products and include them in an automated subject line based on a user’s on-site behavior. On a more basic level, including someone’s name in a subject line also increases the chance that they will open it. Personalized email subject line example. Using emojis in email subject lines is a trend that has been picking up momentum in recent years – I’m sure you’ve noticed! In fact, a report by Experian found that 56% of brands that use emojis in their subject lines get better open rates than those that don’t. The key to using emojis in your subject lines is to ensure they are both eye-catching, on-brand, and on-topic. 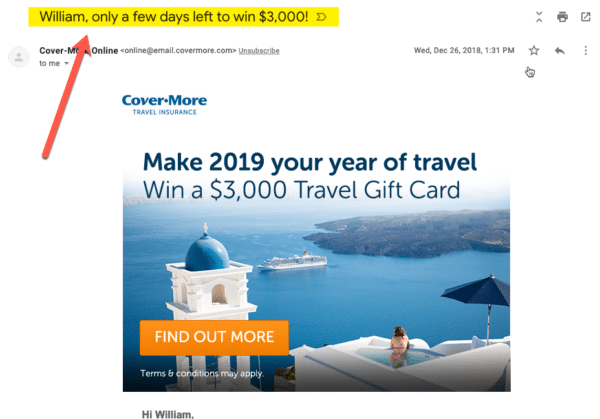 Emoji-backed email subject line example. Writing email subject lines that encourage opens isn’t all about being curious, funny, or driven by FOMO. Believe it or not, but research by Sleeknote found that transactional emails actually receive eight times as many opens as regular marketing emails. You can use this study to your advantage by testing some “transactional” or descriptive subject lines – basically making them less exciting – to see how they perform. 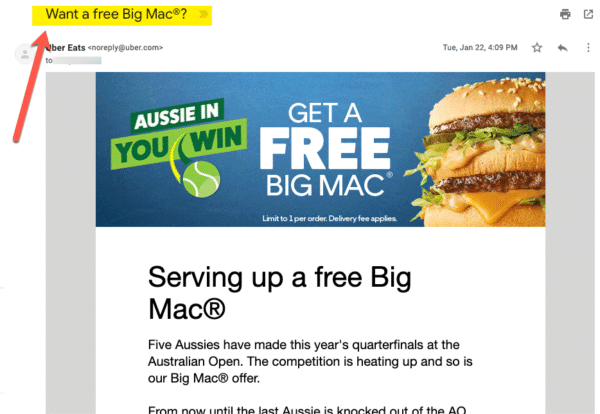 Descriptive email subject line example. 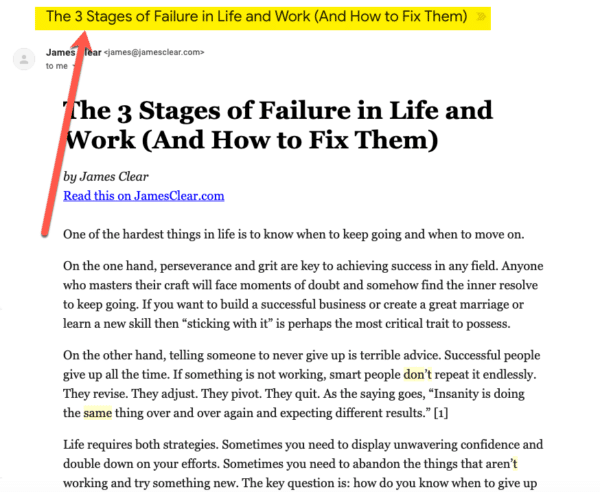 Are you ready to become an expert email subject line writer? It’s not rocket science, but it does take a bit of practice and testing to get right. 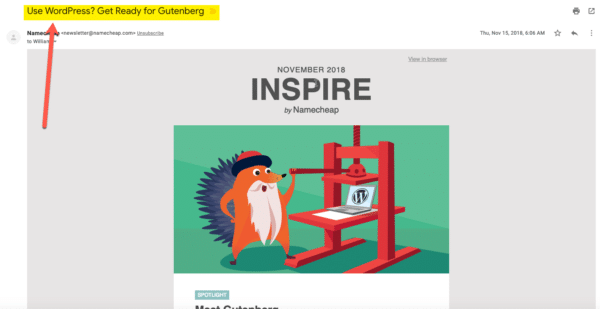 As you can see from the examples provided in this article, most of the best performing subject lines combine two or three of these 13 ingredients in the same subject. So, whether you’re partnering urgency with an exclusive offer, or personalization with an emoji, look to combine ingredients for the best results.